The winner of the Flood Relief Shoot! 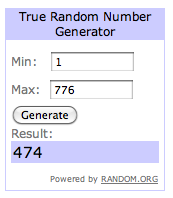 4 Comments to The winner of the Flood Relief Shoot! ps- in case you were wondering who had the last 50 numbers (up to 815) that was me. Obviously I don’t count. LOL. hehe i figured that. Congratulations Jeffi!! You raised a lot of money on your own Liz! Great job!